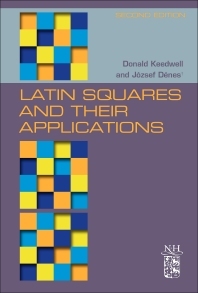 Latin Squares and Their Applications, Second edition offers a long-awaited update and reissue of this seminal account of the subject. The revision retains foundational, original material from the frequently-cited 1974 volume but is completely updated throughout. As with the earlier version, the author hopes to take the reader ‘from the beginnings of the subject to the frontiers of research’. By omitting a few topics which are no longer of current interest, the book expands upon active and emerging areas. Also, the present state of knowledge regarding the 73 then-unsolved problems given at the end of the first edition is discussed and commented upon. In addition, a number of new unsolved problems are proposed. Using an engaging narrative style, this book provides thorough coverage of most parts of the subject, one of the oldest of all discrete mathematical structures and still one of the most relevant. However, in consequence of the huge expansion of the subject in the past 40 years, some topics have had to be omitted in order to keep the book of a reasonable length. Latin squares, or sets of mutually orthogonal latin squares (MOLS), encode the incidence structure of finite geometries; they prescribe the order in which to apply the different treatments in designing an experiment in order to permit effective statistical analysis of the results; they produce optimal density error-correcting codes; they encapsulate the structure of finite groups and of more general algebraic objects known as quasigroups. As regards more recreational aspects of the subject, latin squares provide the most effective and efficient designs for many kinds of games tournaments and they are the templates for Sudoku puzzles. Also, they provide a number of ways of constructing magic squares, both simple magic squares and also ones with additional properties. He has spent almost the whole of his teaching career at the University of Surrey. Since retirement from teaching he has been an Honorary Senior Research Fellow at that Institution. He is the author of some ninety research papers and two books, most related in some way to latin squares. He is a Foundation Fellow of the Institute of Combinatorics and their Applications and a member of the Editorial Board of \Quasigroups and Related Systems". He was the rst secretary of the British Combinatorial Committee and continued to serve in that capacity for 8 years. Also, he was one of the organizers of the 1991 British Combinatorial Conference and editor of its Proceedings. He is probably best known internationally as one of the authors of \Latin Squares and their Applications" of which the present book is a re-written and updated new edition.